The DuPont Industrial Biosciences team made a commitment to demonstrate the value in using technology to gather and analyze information for better and timely decisions – to improve business outcomes. In conjunction with this initiative, the DuPont team found a new way to enhance the creation of cellulosic ethanol – to justify a full-scale production plant producing 30 million gallons of the fuel from 375,000 tons of corn crop residue each year. It all begins at the field level where corn crop residue laying on the ground is harvested, transported, and converted into cellulosic ethanol. While the process isn’t simple, the DuPont team knew that with technology including IoT, Mobility, and telemetry – the process could be more efficient and a new business opportunity could occur. However, there were challenges – with the lifecycle of the corn crop season, there is just a 70-day window to pick up the residue ( “trash”) that would be converted to run the plant for a full year. While 70 days is short, when factoring in inclement weather and potential downtime, there is in reality approximately 32 days to do the harvest. With balers (the machines that pick up the corn crop residue and compact it) for transportation to the processing plant from the farm, DuPont needed to work with various baler manufacturer technology. Another challenge was the potential of fires from lightning, etc. Notwithstanding the challenges, DuPont found plenty of silver linings. “ We determined that with the use of Telemetry, IoT, and Mobile Apps we could build a solution to drive communications, notifications, and value ” said Chris Hewitt, DuPont’s Center of Excellence Leader. 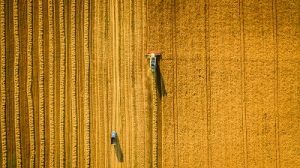 “ DuPont designed a solution to introduce a flexible, robust telemetry model, marrying the harvest equipment into one data receptacle with the ability to analyze data and meet customer needs ”. What came from this DuPont innovation initiative was an IoT breakthrough – with data that enabled the field crews to know where to be and when. By connecting tractors and balers with a single receptacle, they began capturing real-time information for the first time – resulting in optimizing the crews and delivering cost savings. Extending on this, with Mobile Apps and a dashboard, field crews and administrators were able to view moisture levels in the bale and monitor equipment idle time – a substantial metric considering tractors and balers are measured on hours used, not mileage. Further they could determine when a bale with a missed tie was thrown into the field – to mitigate damage with farm planting equipment the following season. In summary, this project realized significant benefits with data-driven decisions and logistics – from an automated communications process by which measurements and other data are collected at remote points and transmitted to receiving equipment for monitoring and subsequent action – in real time.